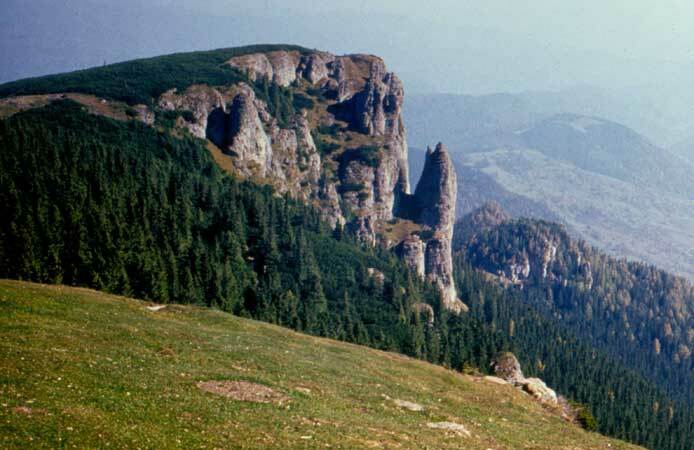 The Romanian toponimy is vast. 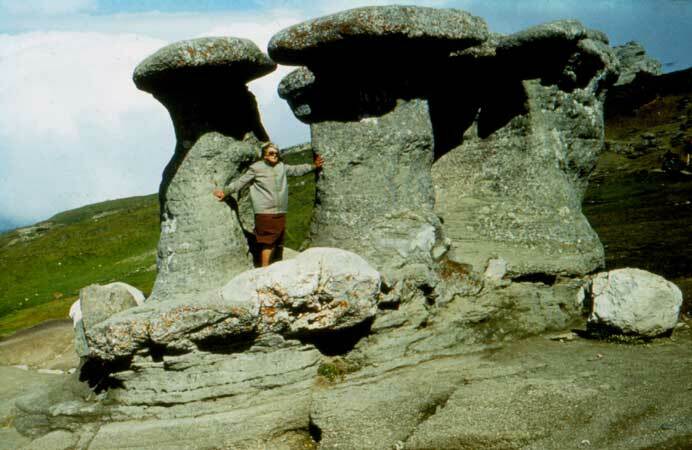 I will try to show a small part of the named rocks I have visited; the antropomorphic ones are shown in the album published in 2007. 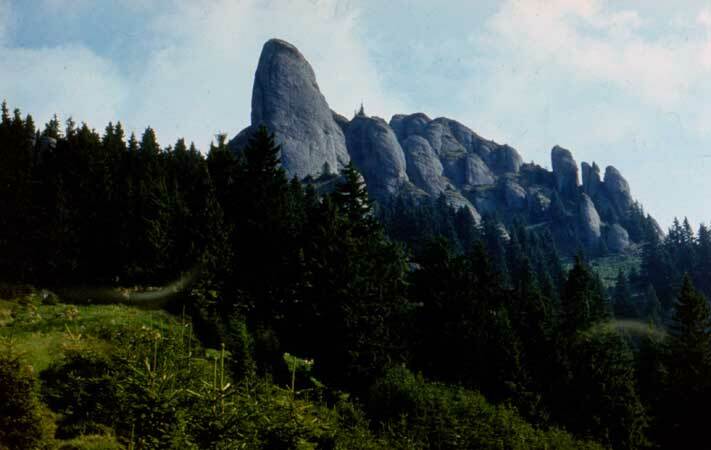 The photos are sorted according to location: north of Eastern Carpathians, then Meridional Carpathians and Western Carpathians. 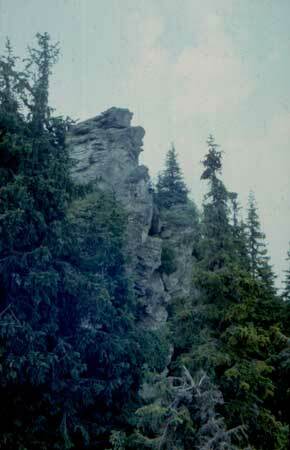 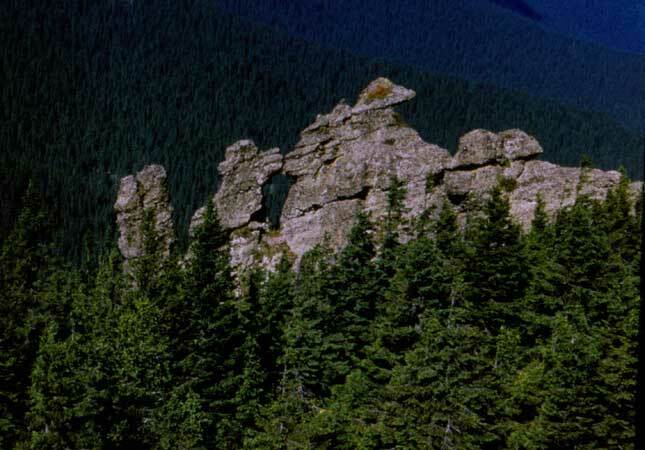 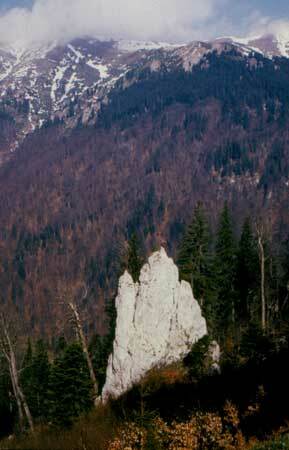 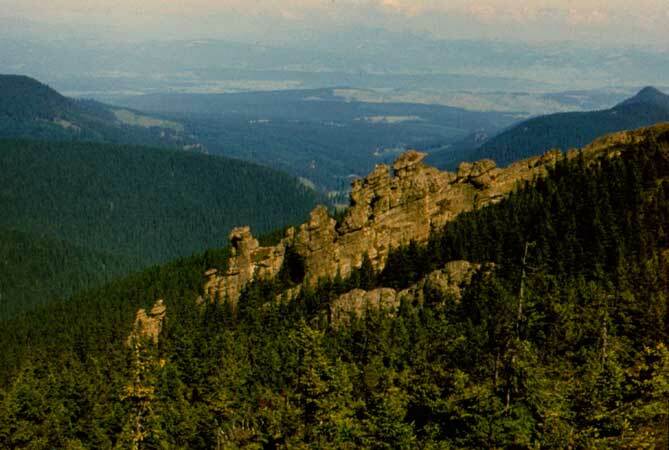 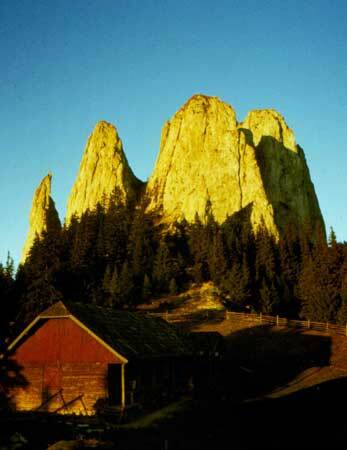 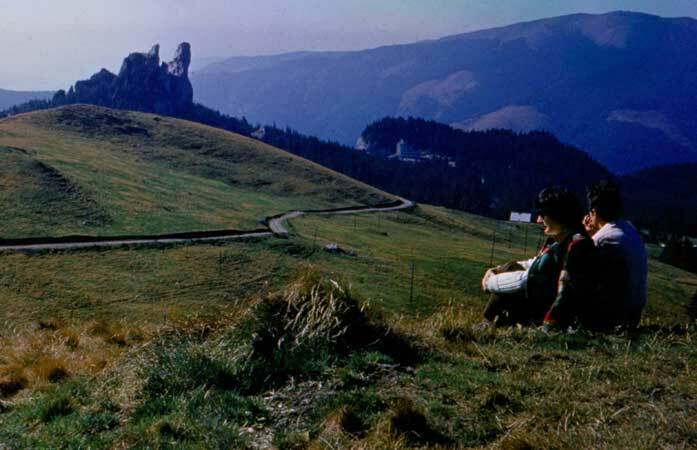 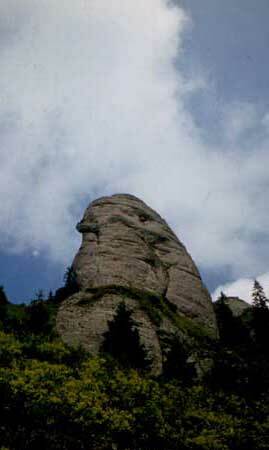 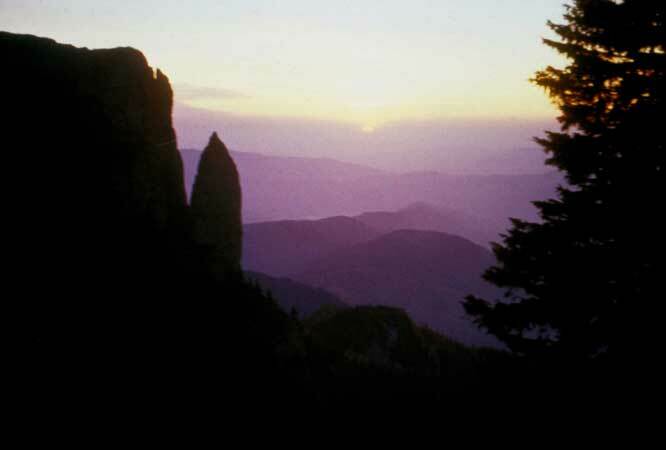 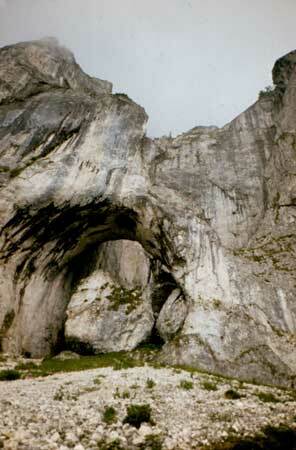 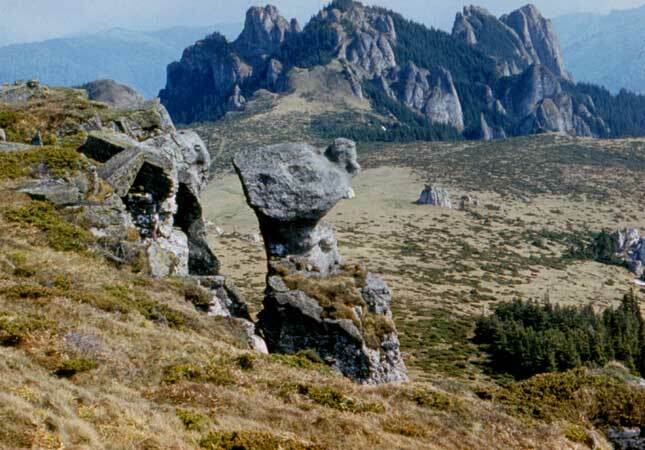 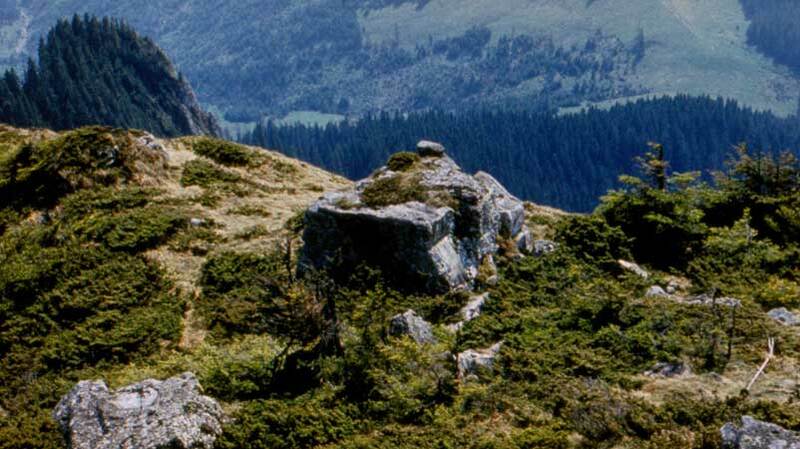 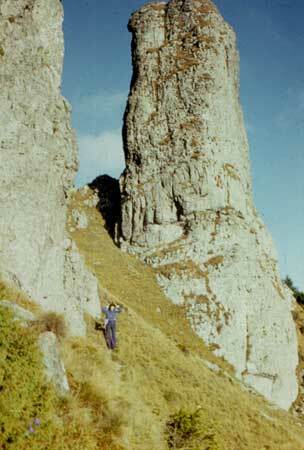 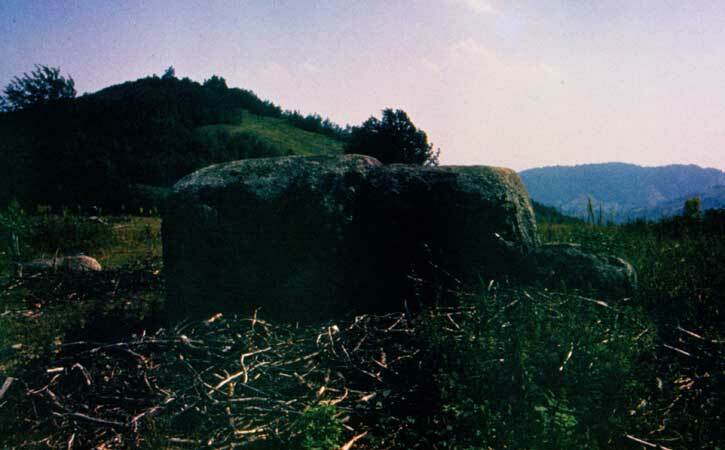 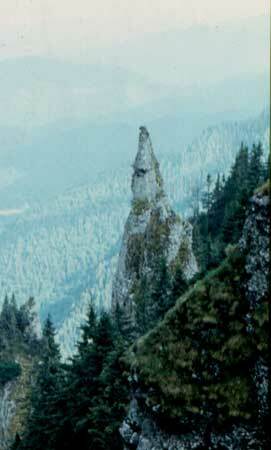 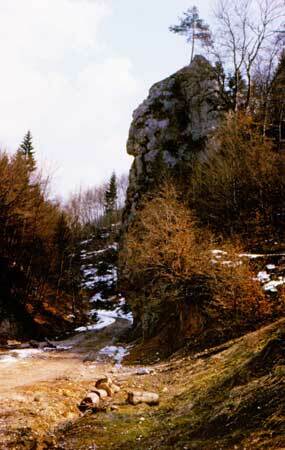 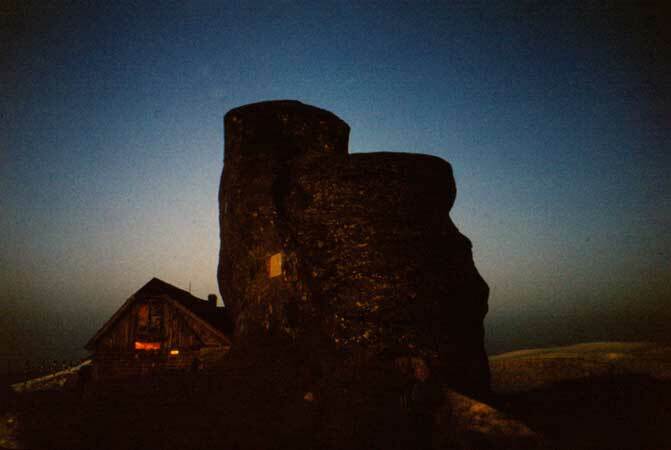 They lie northwest of the city of Solca (Suceava County) on a rocky peak that dominates the valley of Solcuţa. 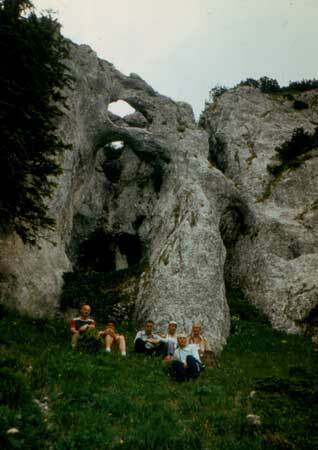 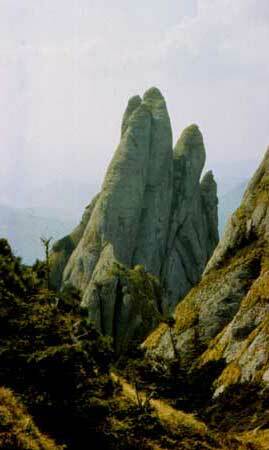 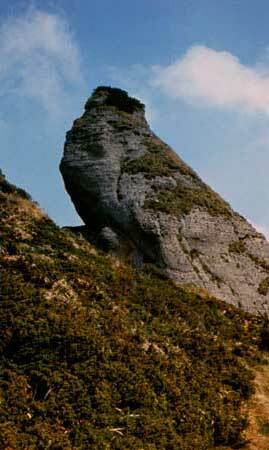 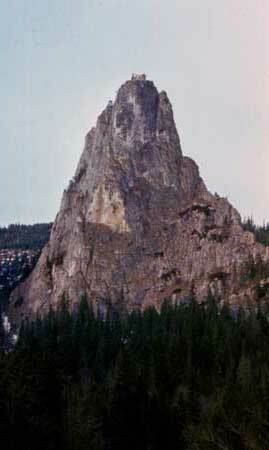 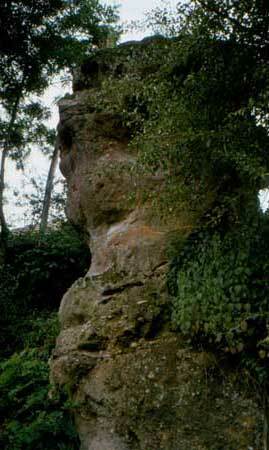 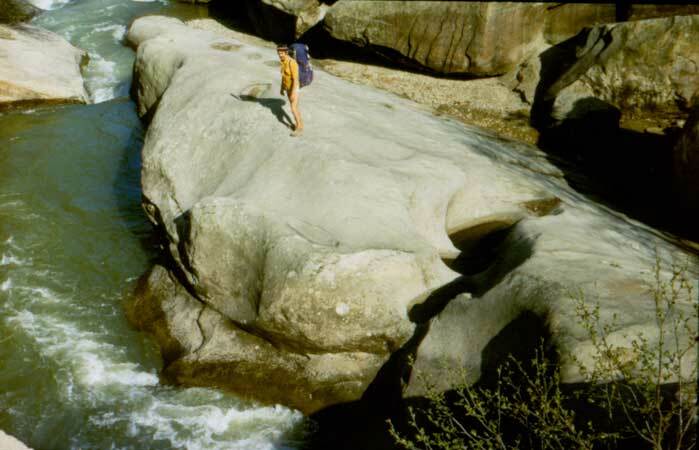 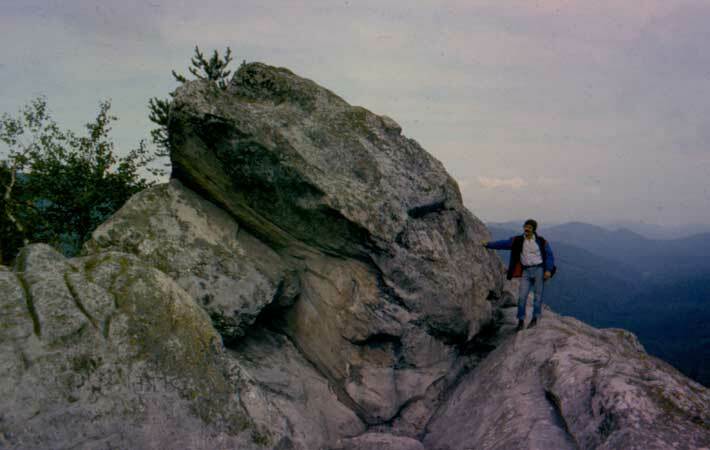 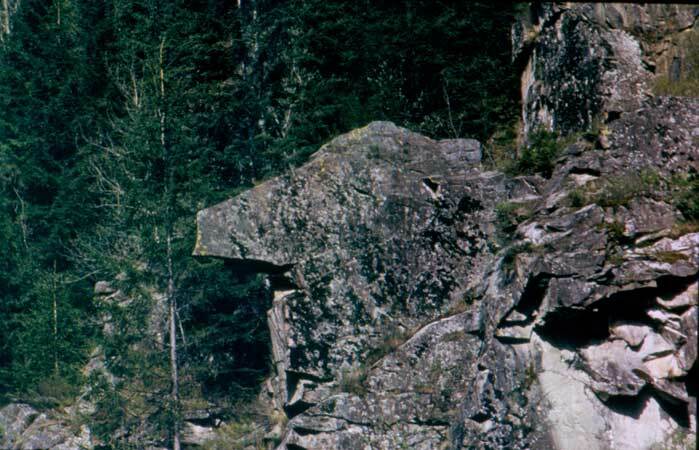 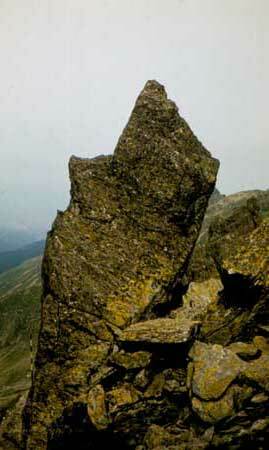 There are six main large rocks that have turned into interesting shapes through differential erosion. 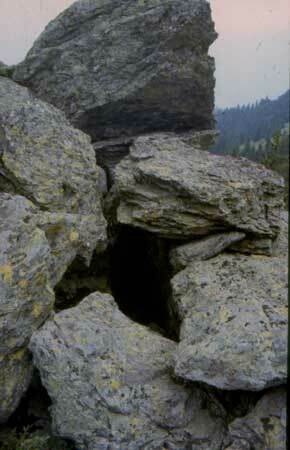 They say it was a good place to shelter during enemy invasions. 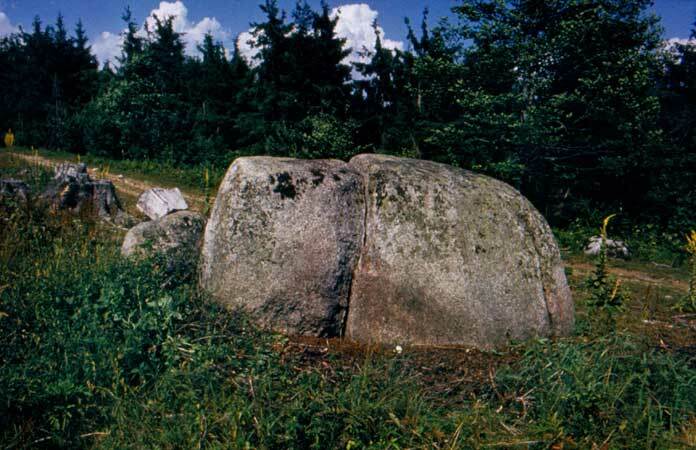 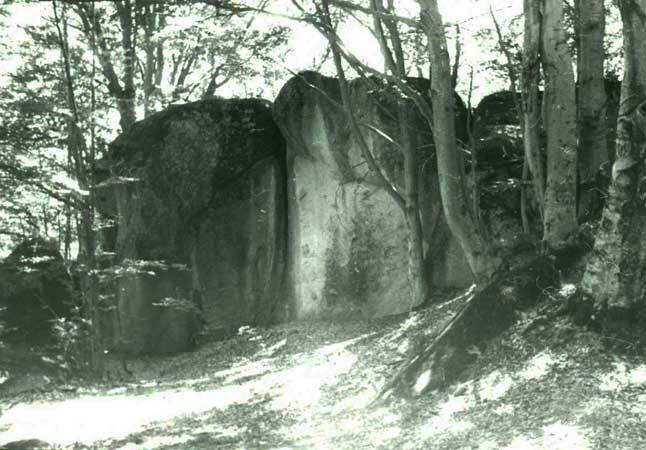 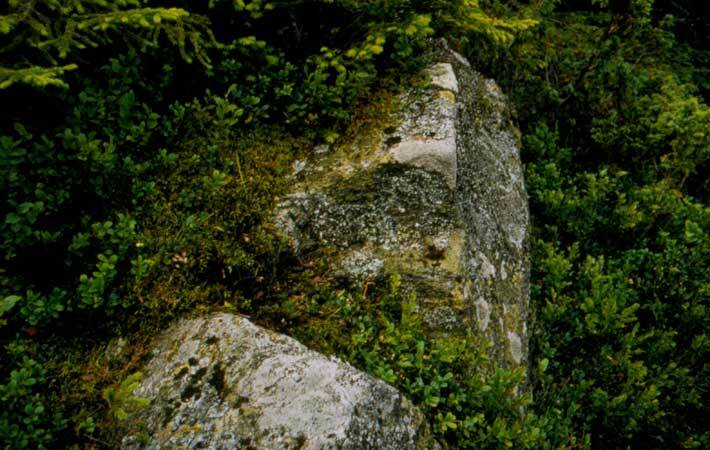 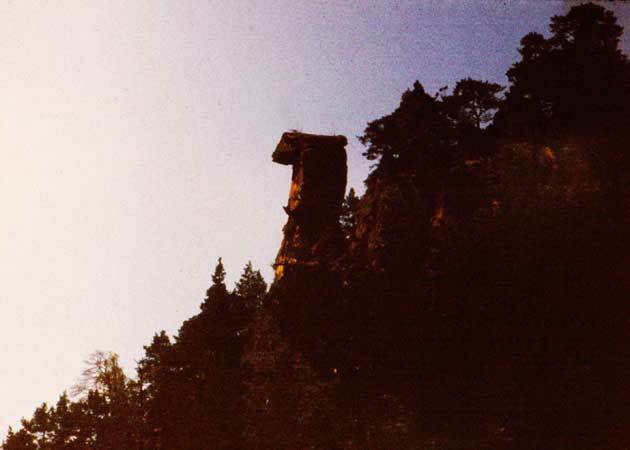 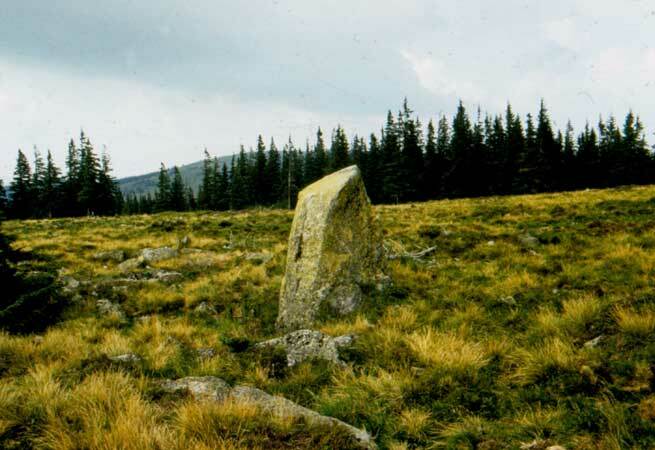 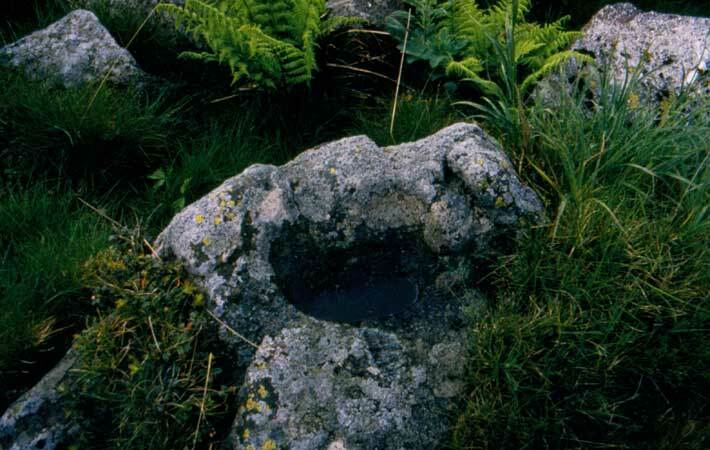 ALTAR STONE - Massive Hasmas – one can see the cottage that had several successive names: Queen's Flower, Flower of the Republic, then Bicaz Gorges, it caught fire from the Christmas tree on December 25, 1997. 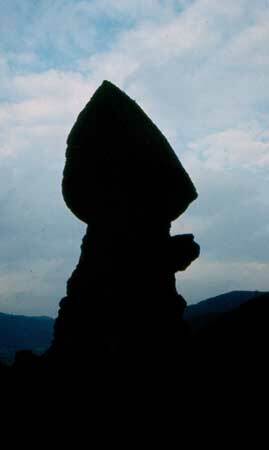 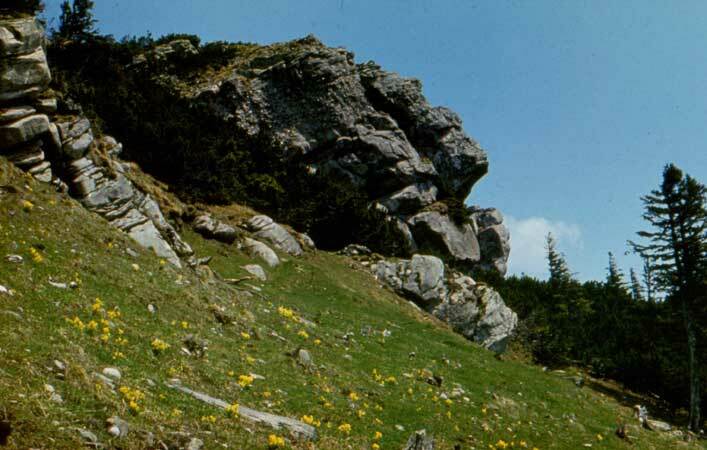 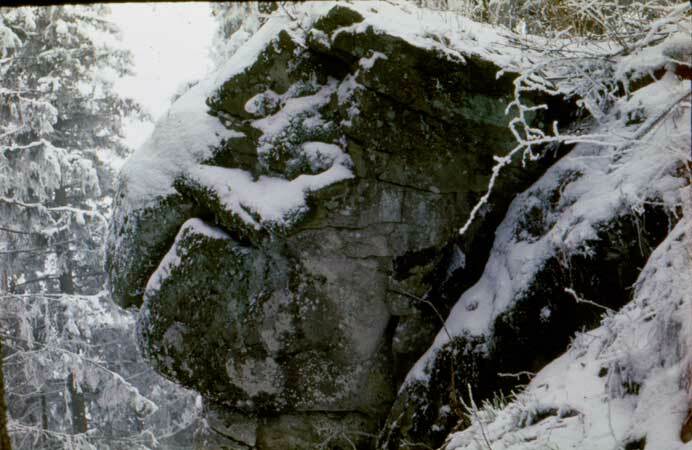 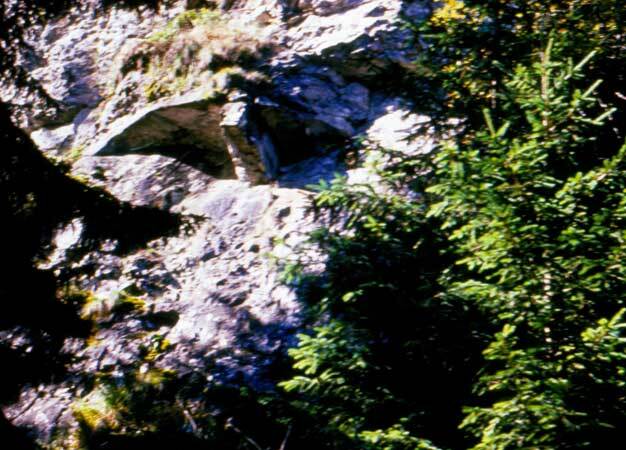 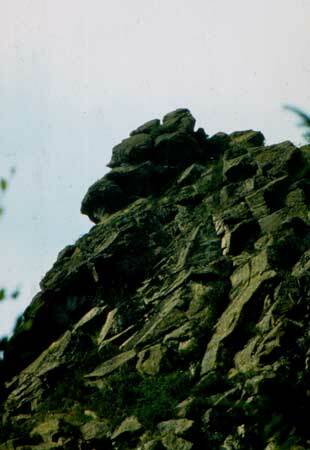 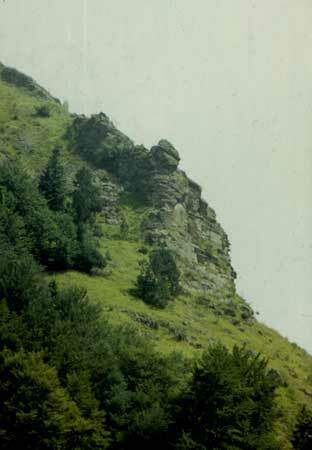 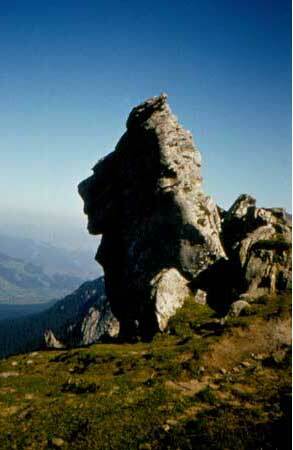 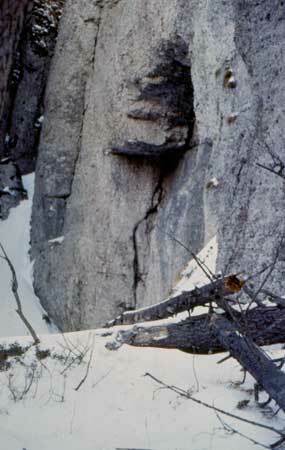 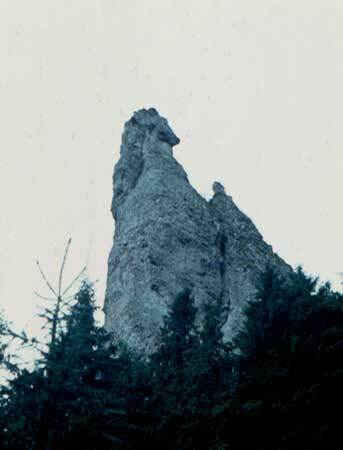 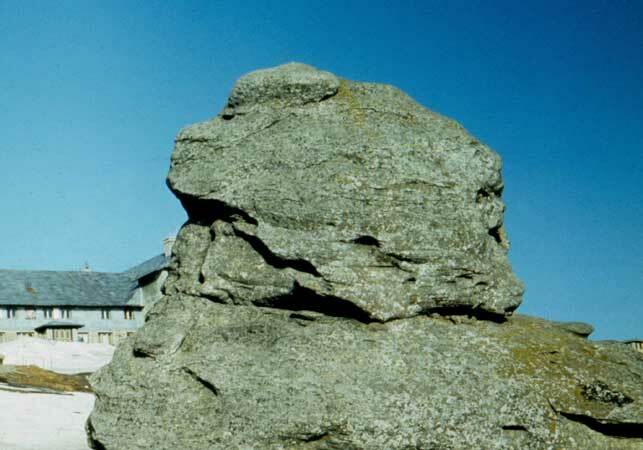 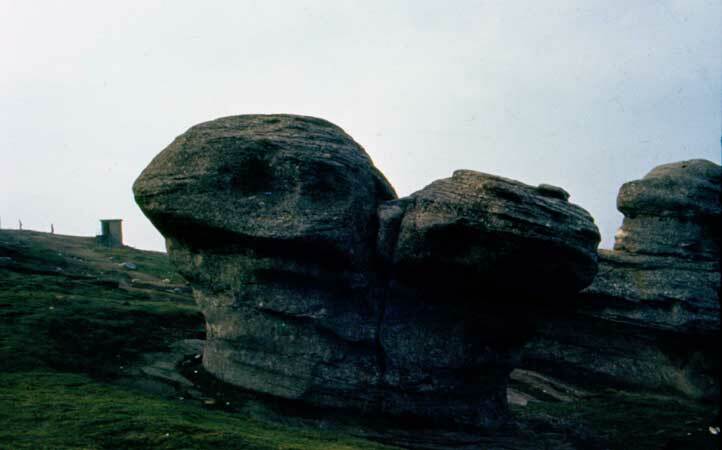 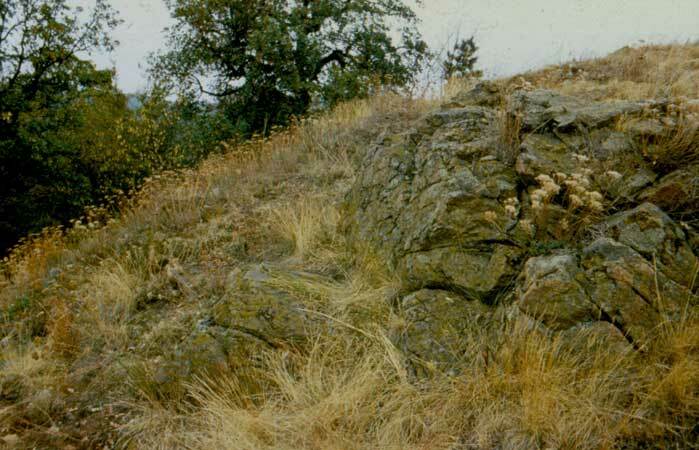 MAN OF ŞERBEŞTI - Stefan cel Mare village, Neamt county: the whole hill looks like a man lying face up with some rocks forming a human profile. 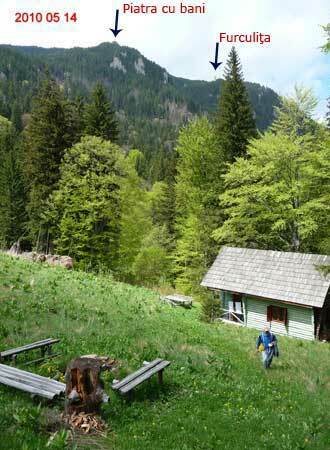 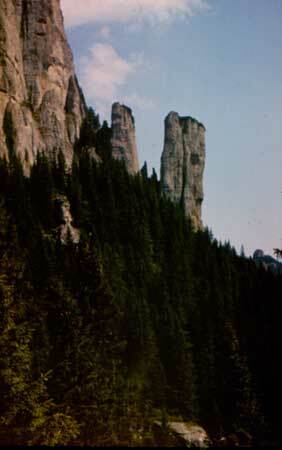 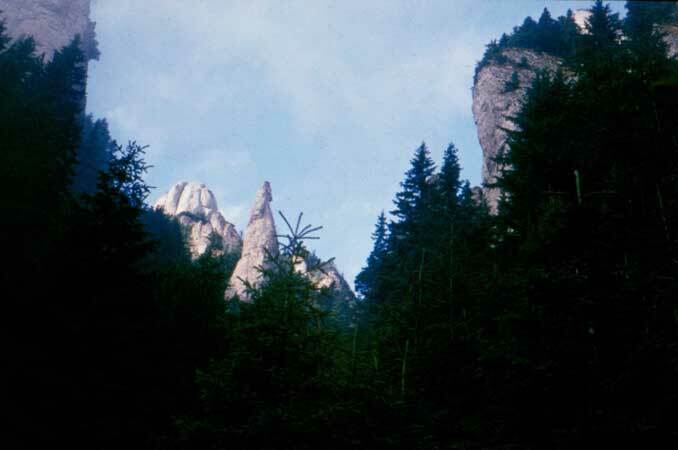 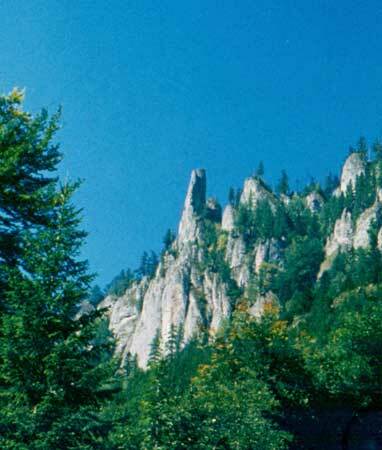 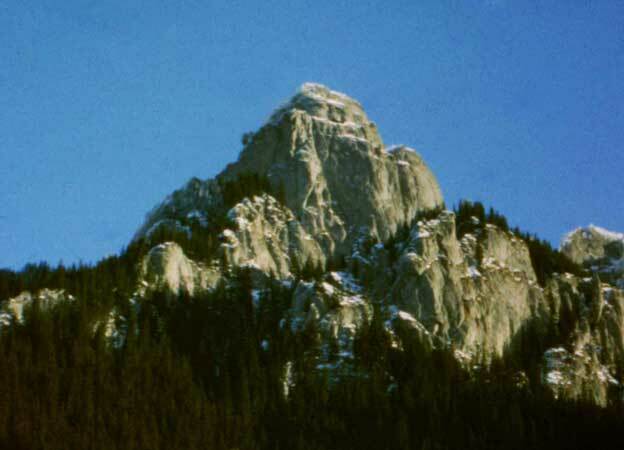 It can be seen from the roadway from Piatra Neamt to Roman. 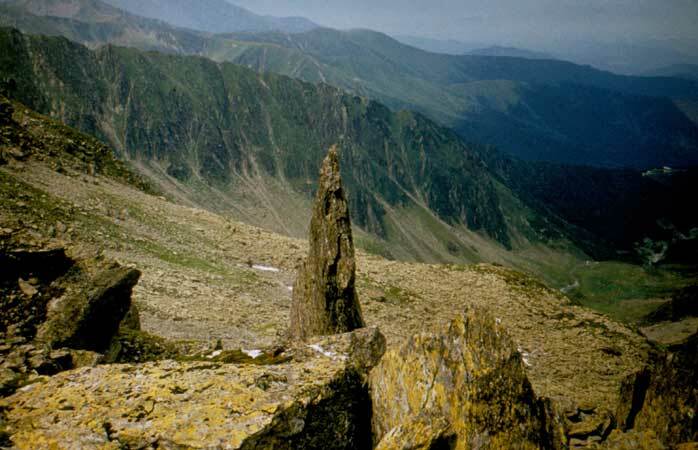 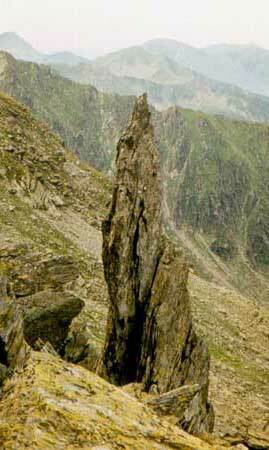 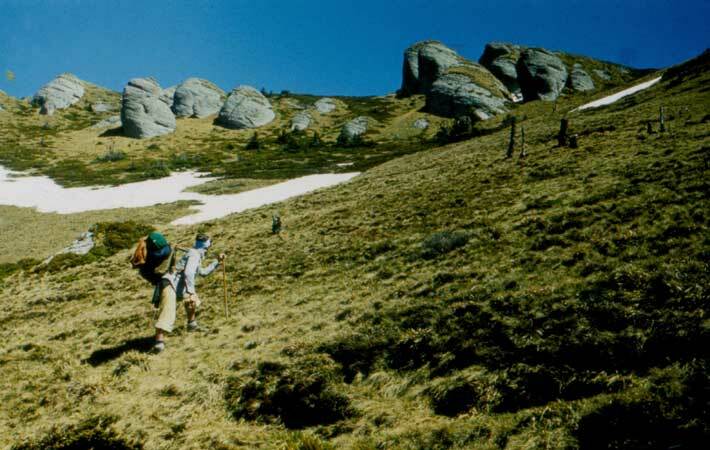 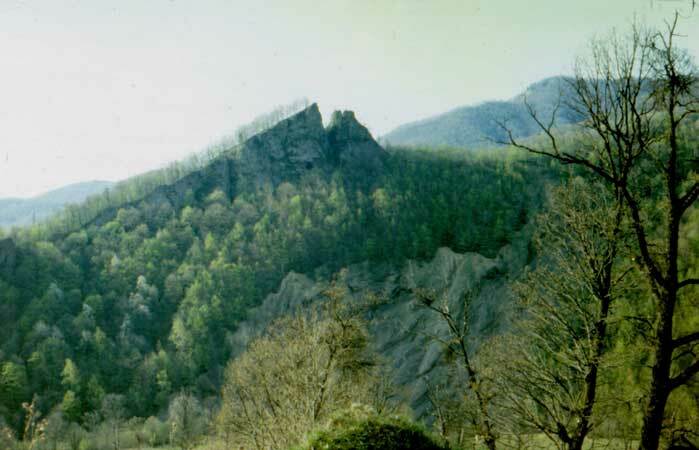 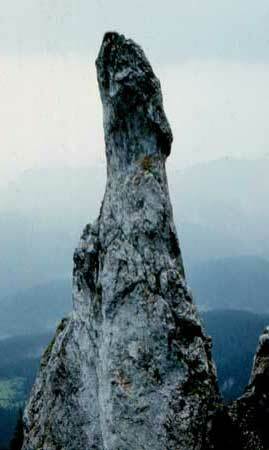 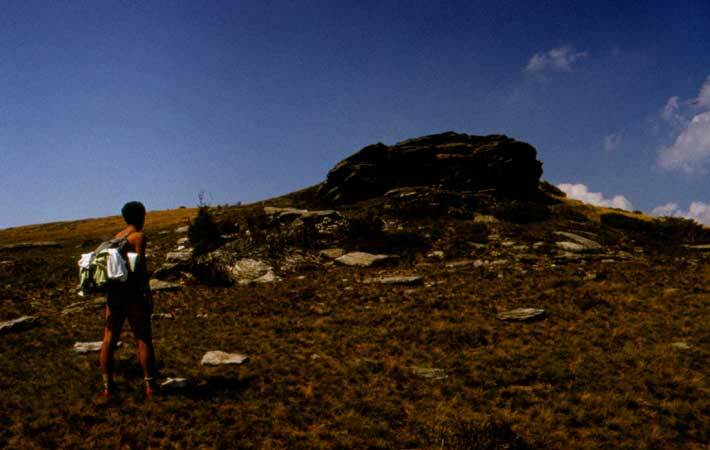 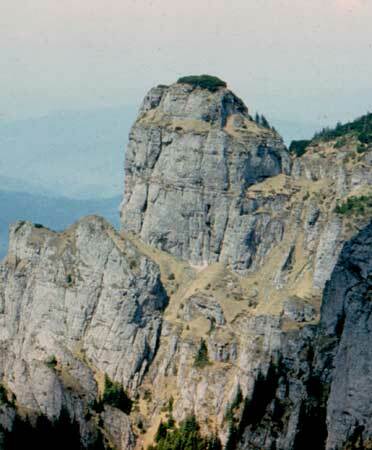 IORGOVAN’S SLASHED STONE - Vâlcan Mountains, 1617m, is located at the top of Little Mount (Muntele Mic) is on the trail marked with blue tape down to Poiana Mărului. 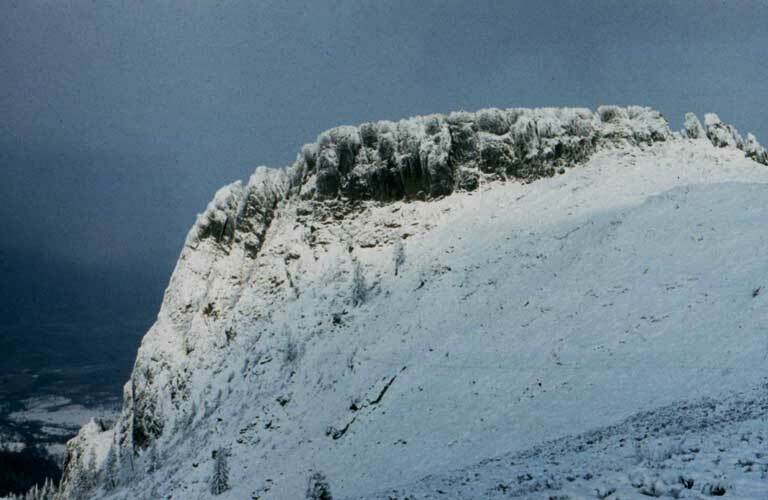 CLEANŢU SCORILEI - Ţarcu Mountains, 1617m, is located east of the peak of Little Mount (Muntele Mic) on the trail marked with blue tape down to Poiana Mărului. 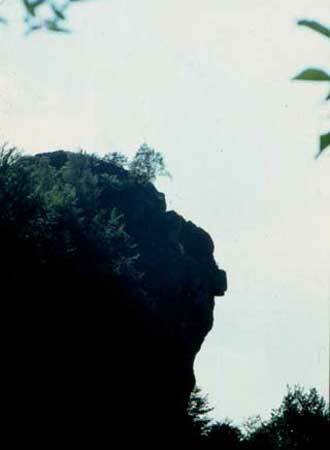 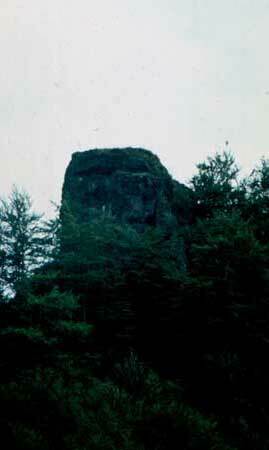 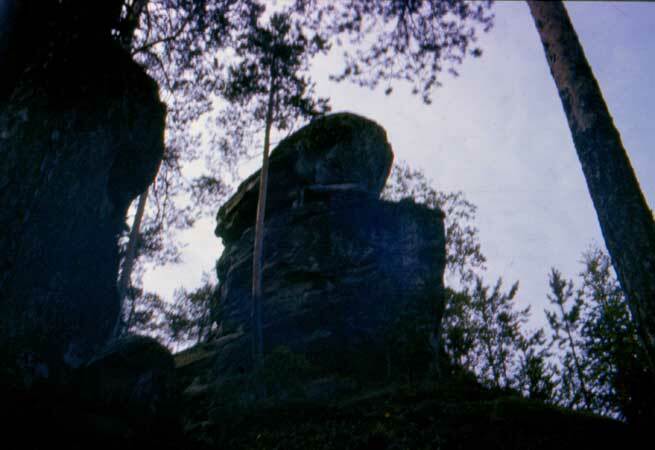 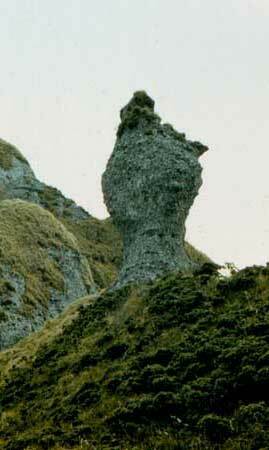 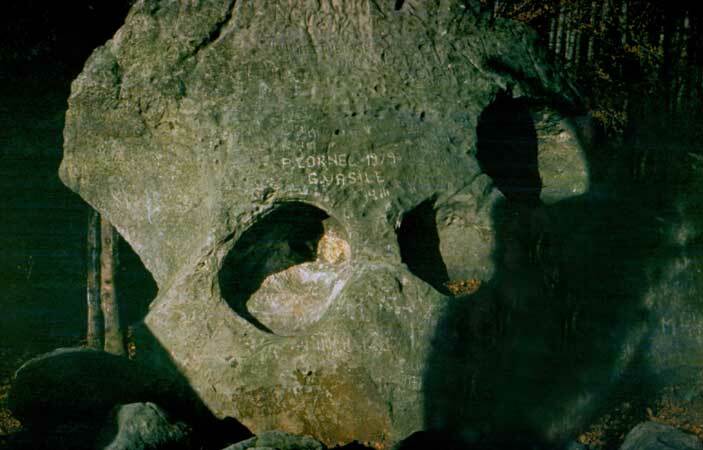 Vague legends of the area considered the rock as an observation point over the Scorila river valley. 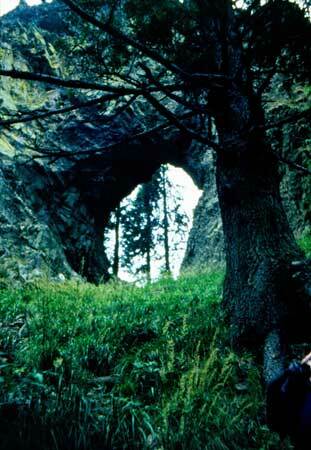 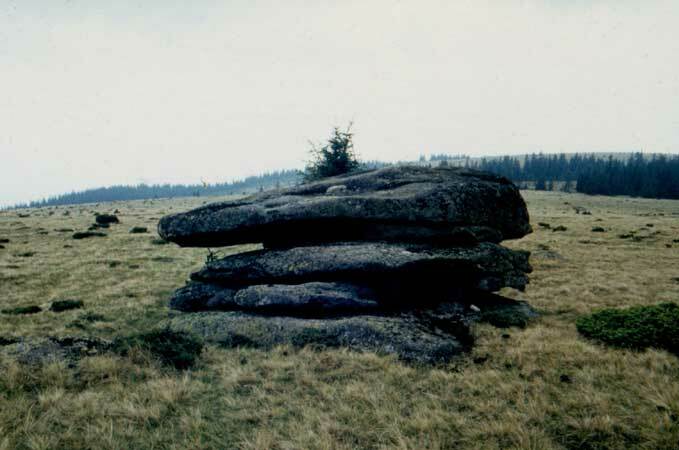 Between the rocks around it seems that two shelters have been improvised using the stones position. 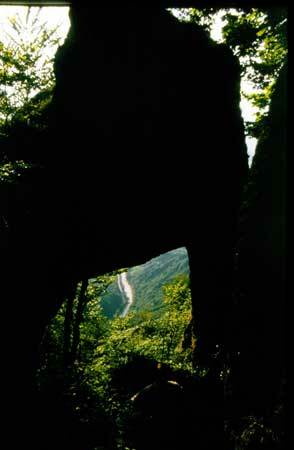 Up to the west there are some large grooves that (hypothetically) could be covered with logs, branches and moss, and would have created some useful shelter for local families in the valley, in times of trouble. 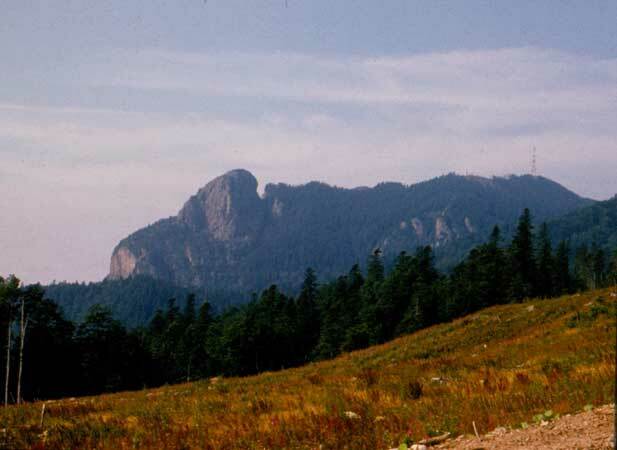 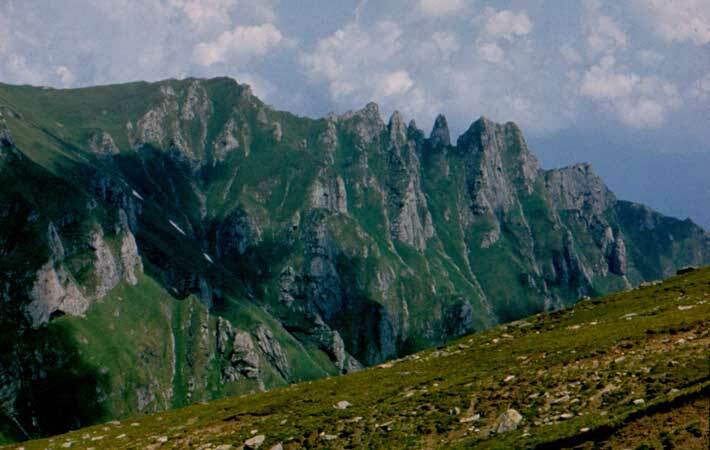 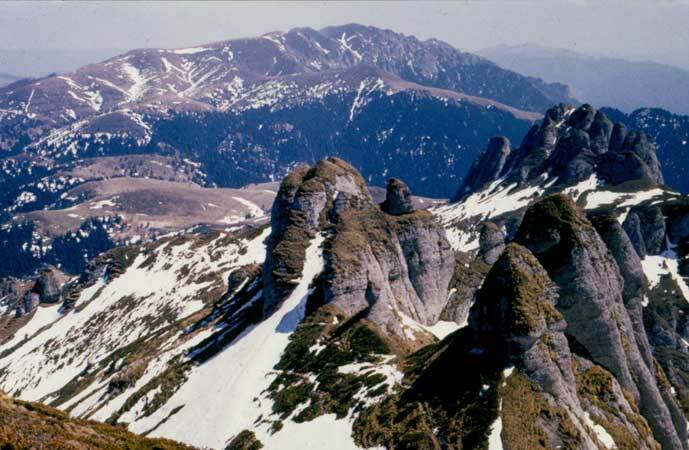 GERYON'S SEAT - Mehedinti Mountains. 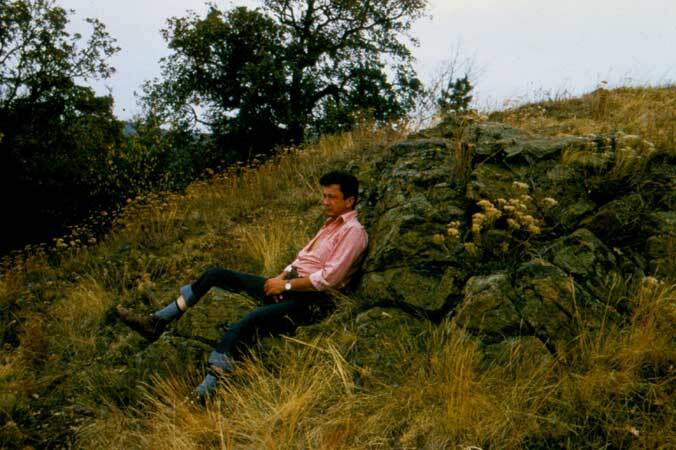 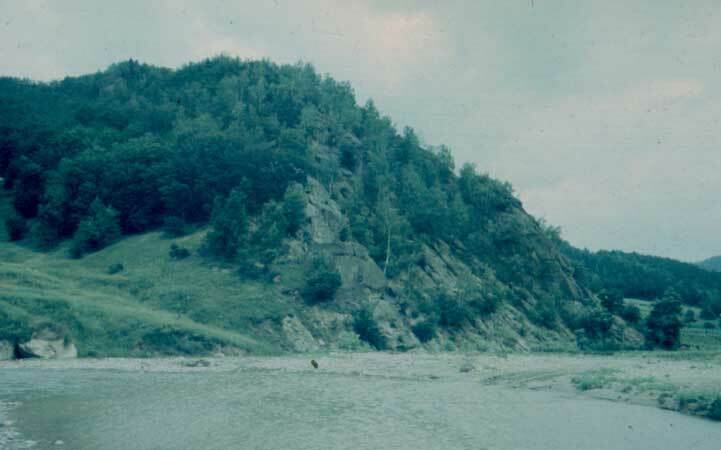 The idea to look for it was given to me by Nicolae Densuseanu after studying his book; I gathered further information from the only man that remained on Vodita valley in 1987. 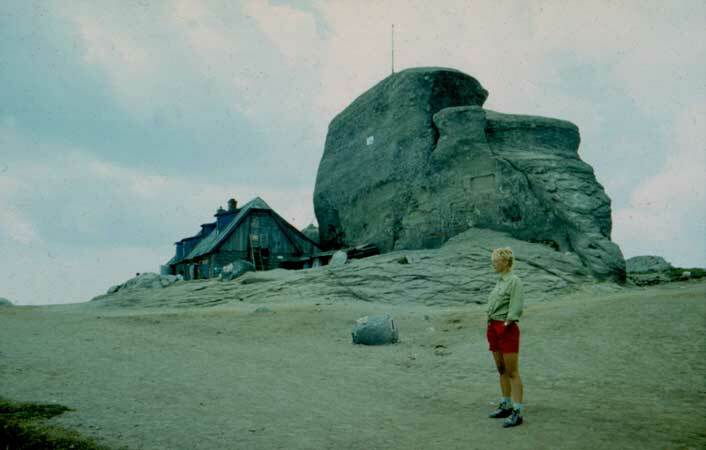 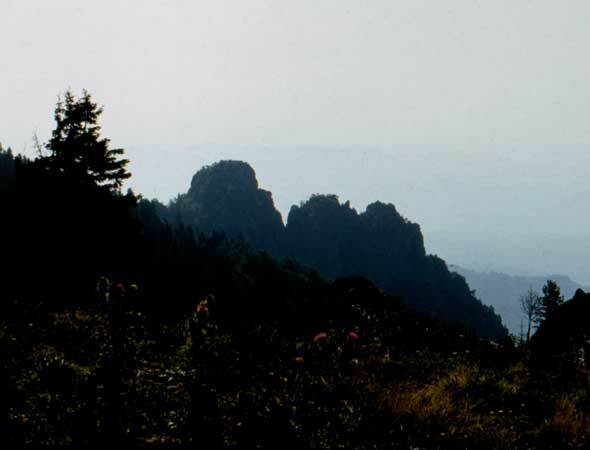 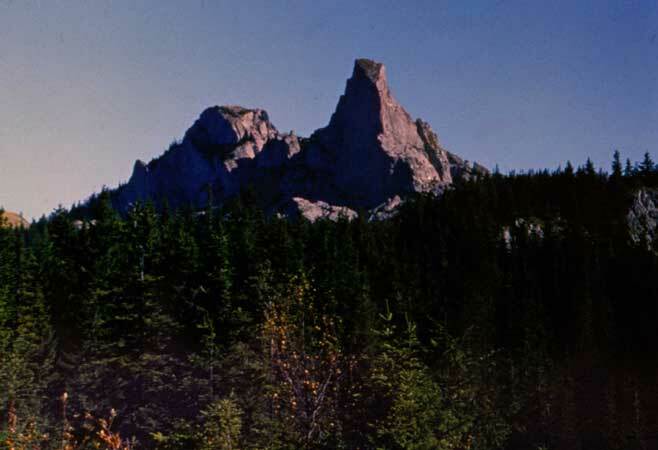 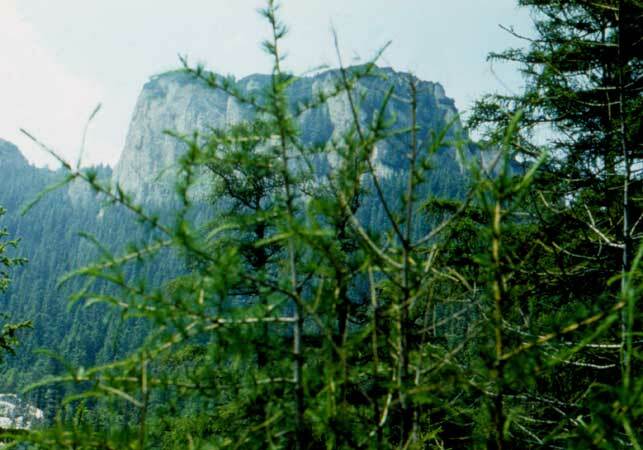 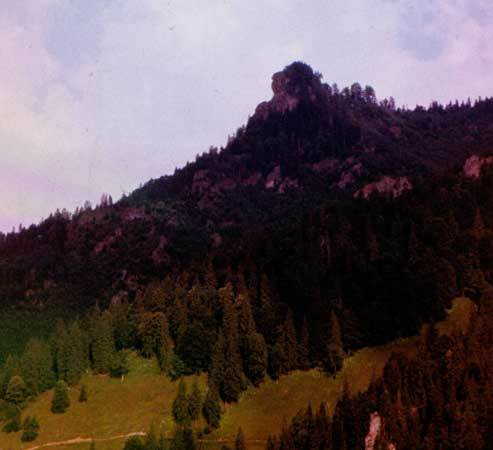 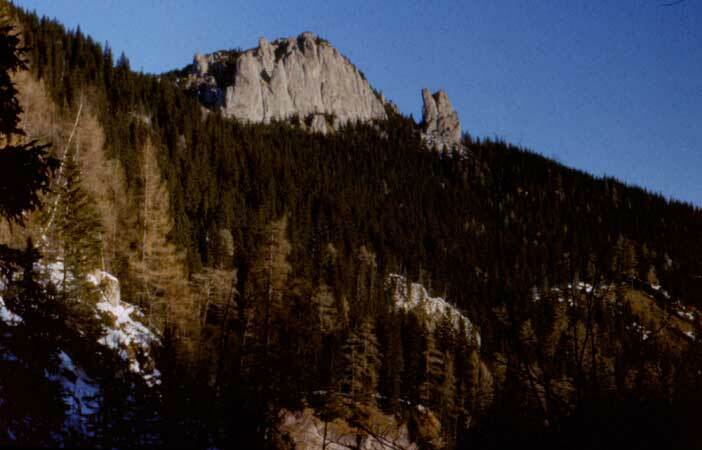 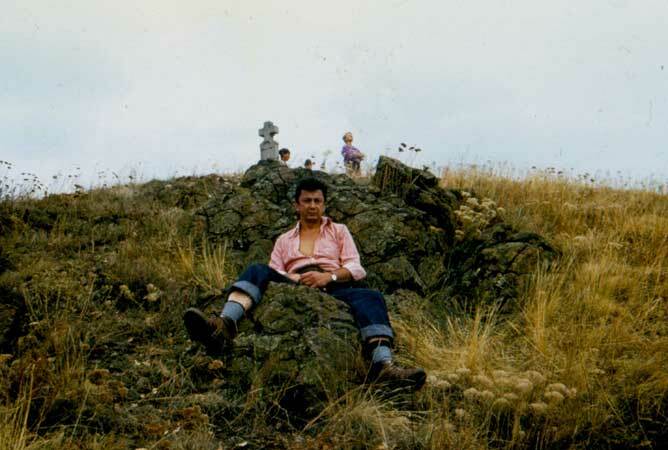 In 1990, with approval from the guards of the police unit from Gura Vaii and accompanied by two soldiers (because it is the border area and I was going to take pictures) we climbed the Cross of St. Peter Peak. 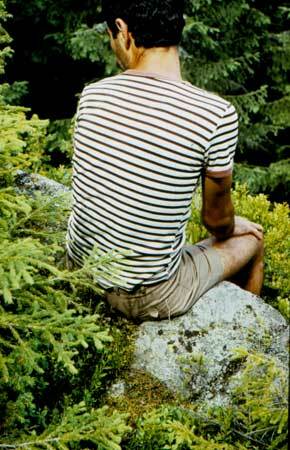 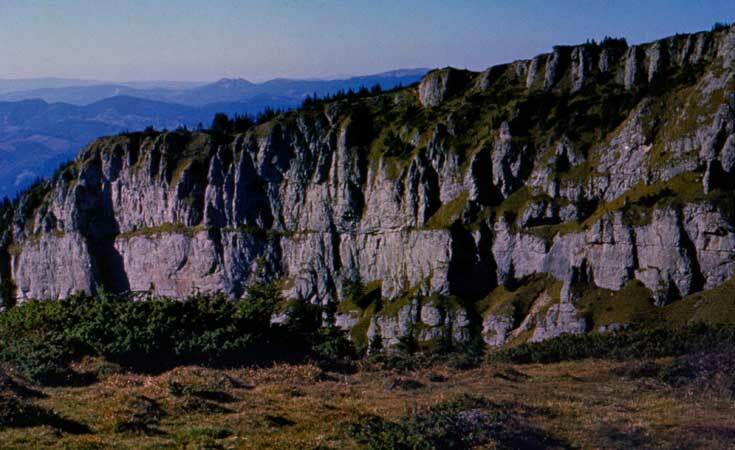 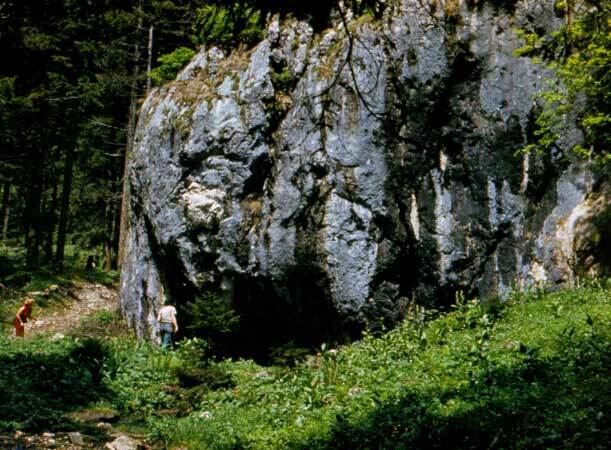 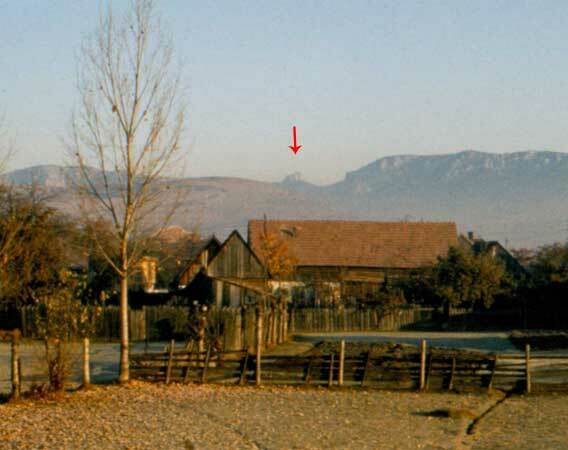 We could recognize the SEAT on the southern slope, about 5 metres from the peak, towards the Danube. 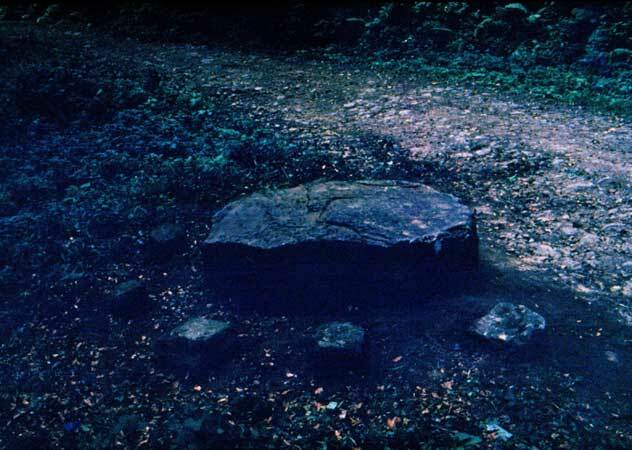 The traditional holy celebration held here is probably older than the current religion. 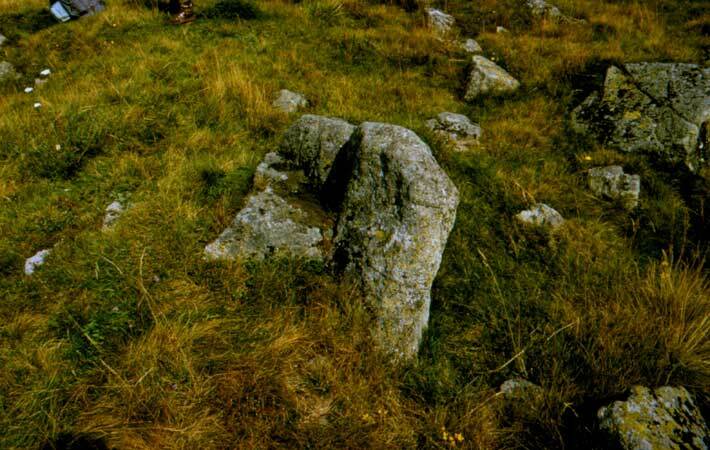 An annual mass is held at present, although the old rites, which had to be silenced, is no longer valid. 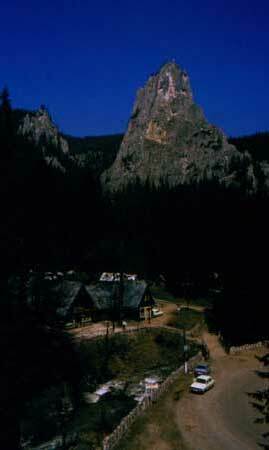 The LITTLE CHURCH on Negrileasa peak, Trascău Mountains. 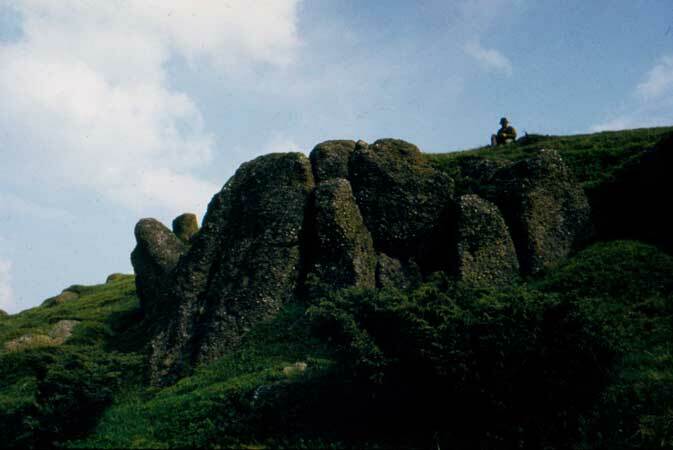 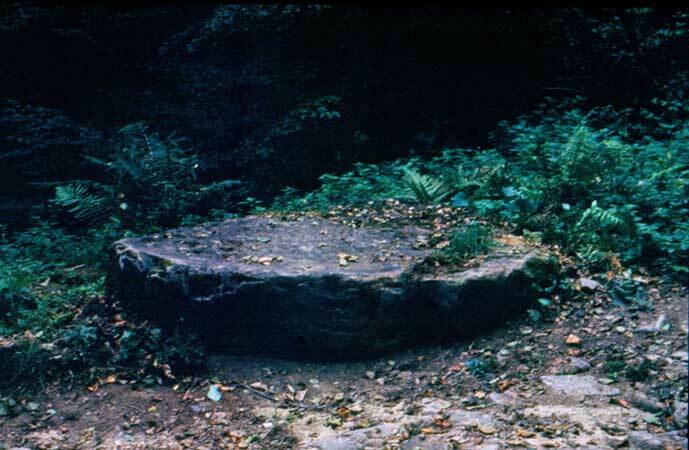 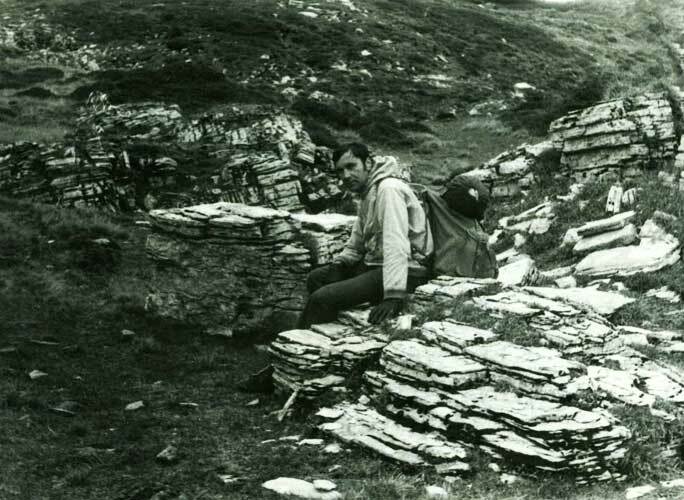 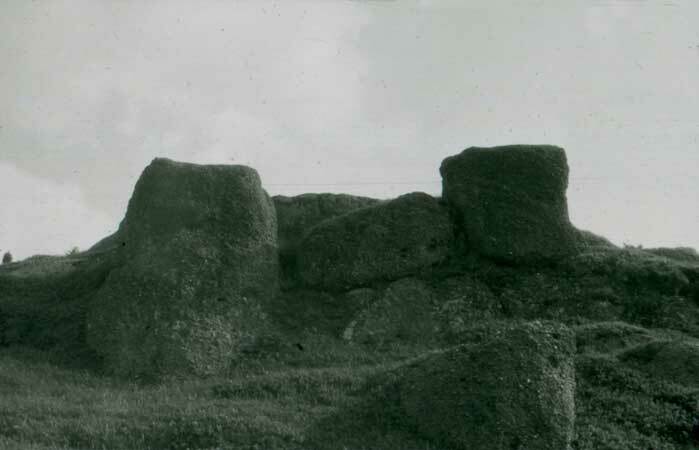 It consists of two groups of rocks that seem arranged: - the group below seems to have been some sort of shelter - about 20 metres up is a trill consisting of two towers at three metres apart (they look like they were two columns with round section) and one horizontal block inbetween, now broken; under these rocks there is a small platform. 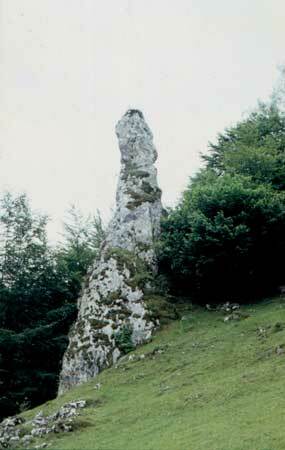 (it seems to have been a place of worship). 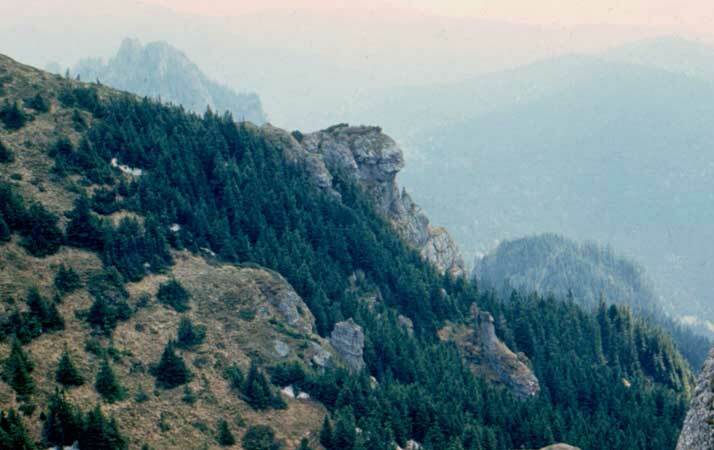 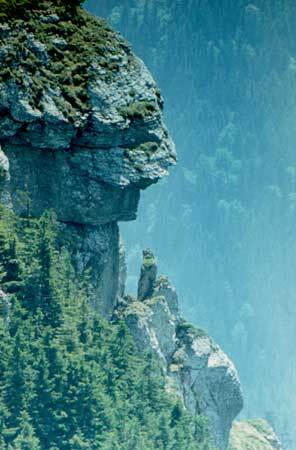 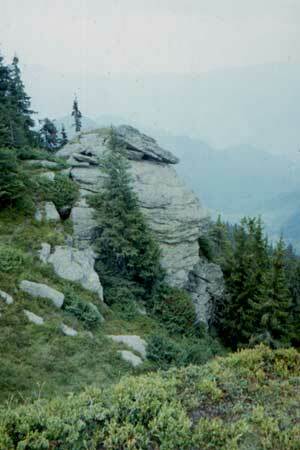 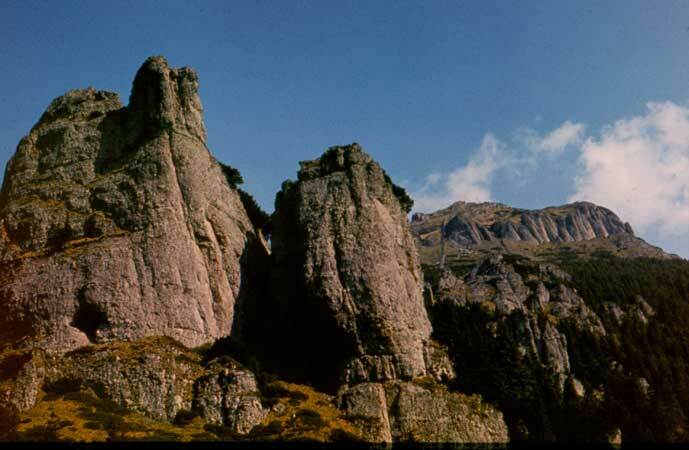 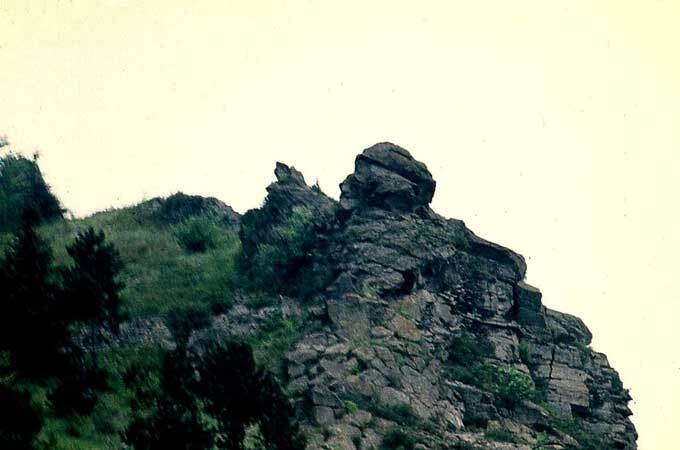 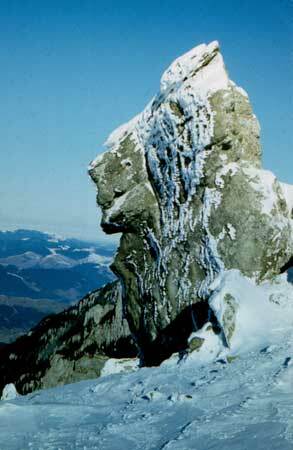 THREE YOUNG MEN Rock or maybe 3 FACES seems to be a rock with three faces: child - adult – old man, from the Surligata peak (Trascău Mountains). 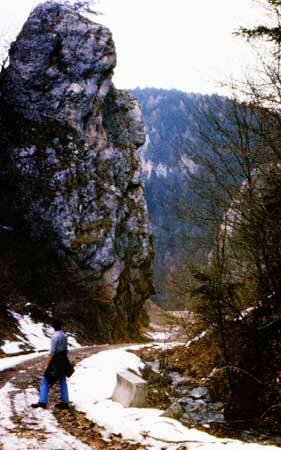 Access is easier throughLupşa river valley, a tributary of Aries. 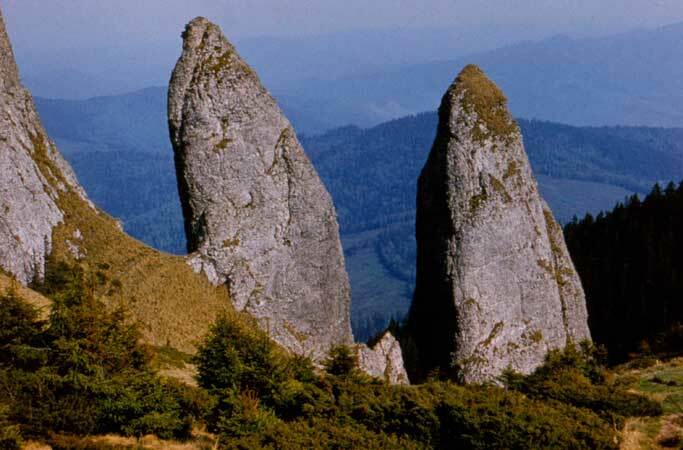 SMALL STONES (PIETRELE MĂRUNTE) - Big Mountain (Muntele Mare) – they are not realy small: they look like a row of menhirs, useful during fog (if you lie flat on your belly you can see the next stone!). 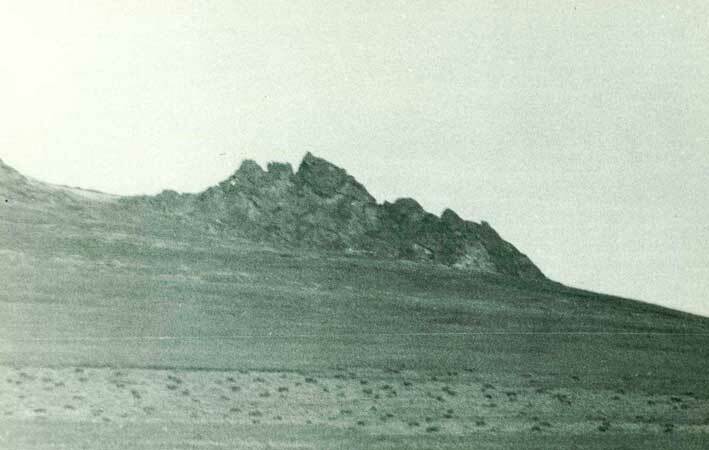 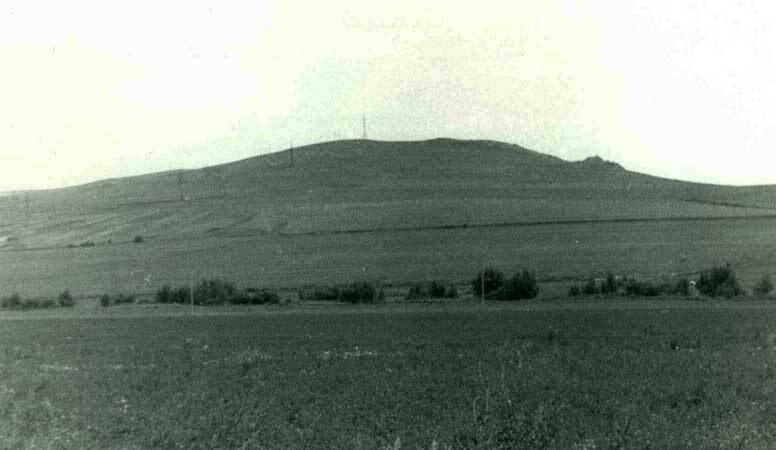 To the southwest there is the Hungarian Corner (Colţul Ungurului), a place called "La masa" and then the Big Mountain peak, and to the NE the Round Corner (dynamited for the purpose of road construction) and about 600 meters further the Warm Plain (Şesul Cald). 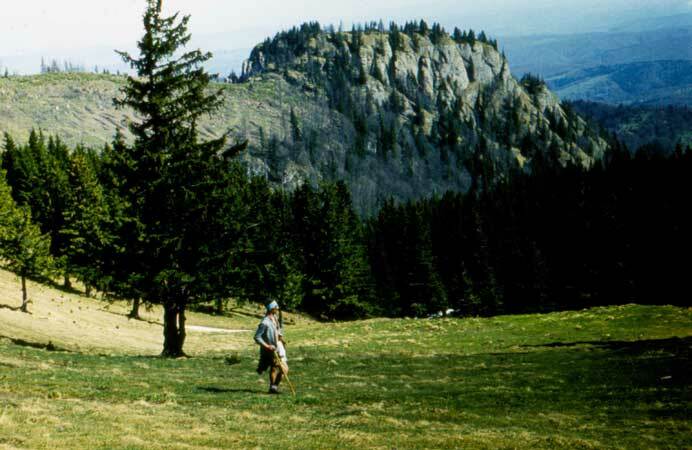 From the Warm Plain (Şesul Cald) to Aries Valley (east), through "Zăcători" can be reached through the forest planted in 1976 at the edge of a steep of 12 to 15 meters where there are several rocks covered with moss, bilberry and mugo pines. 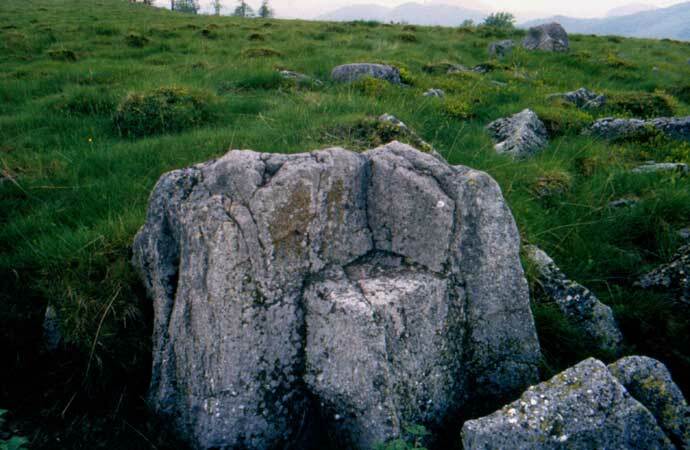 One should look for a flat surface with a groove for seating! 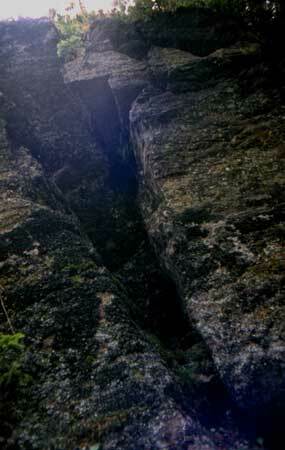 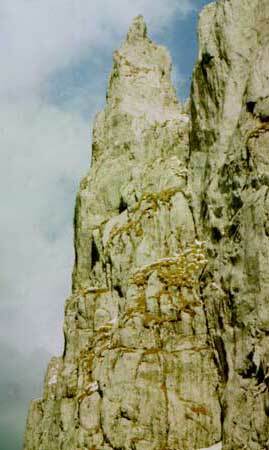 and below it a place as a square crack 130-140 cm in height, width of 50 cm and depth of about 80 cm: LA DUBA! 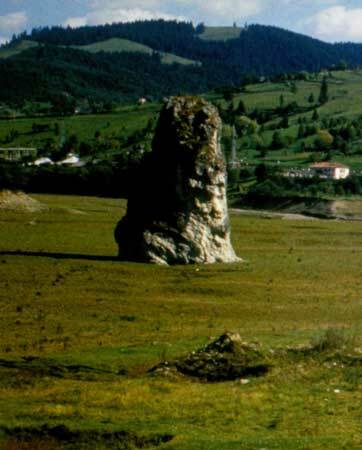 In the local sense of place where they gave a signal with a horn or tulnic. 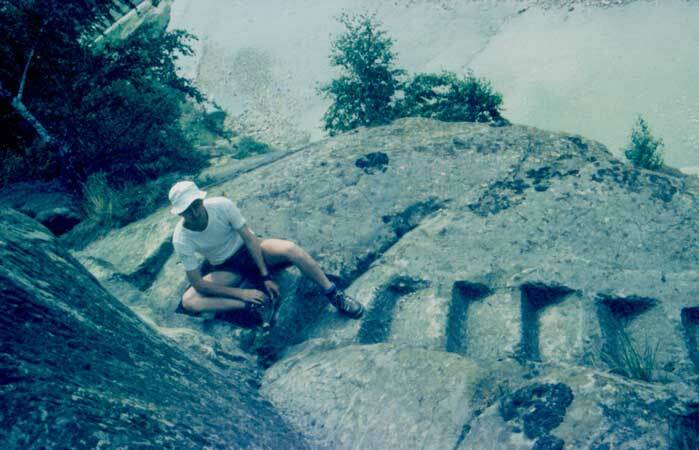 We could have done with a teammate on the Aries valley and also cellular phones (which had not been with us in 1986) to test the signaling procedures. 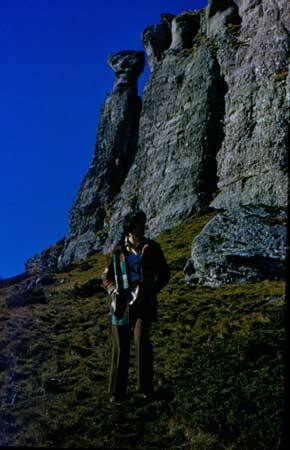 After years of travels I arrived to a conclusion and I kept it for a long time for myself. 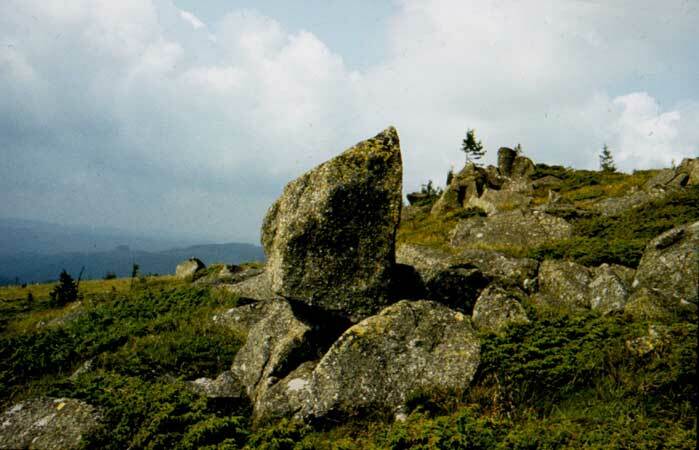 It would seem that there is a cluster of named rocks known that could have strategic and even practical importance and could have constituted a chain of observation points and signaling. 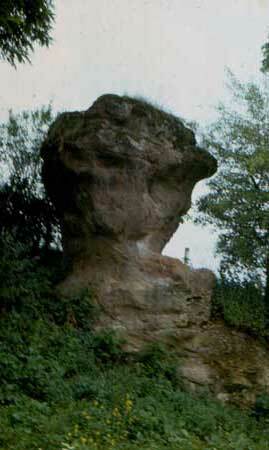 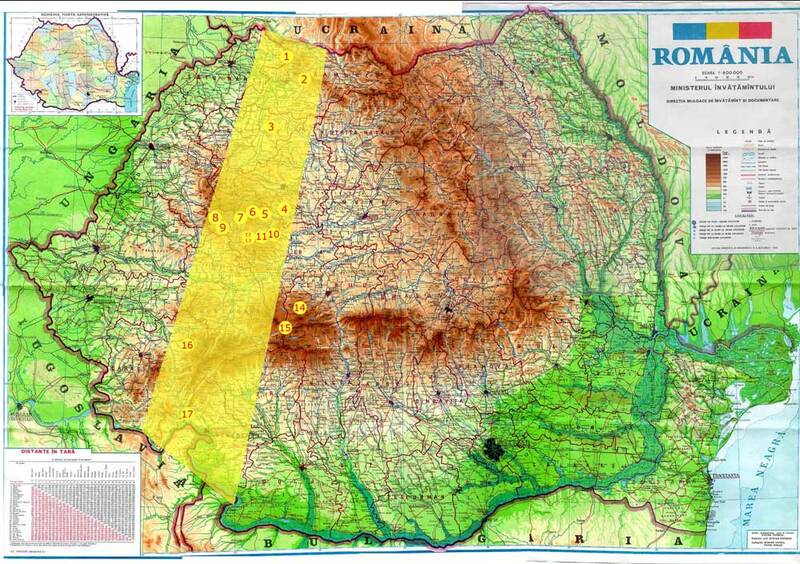 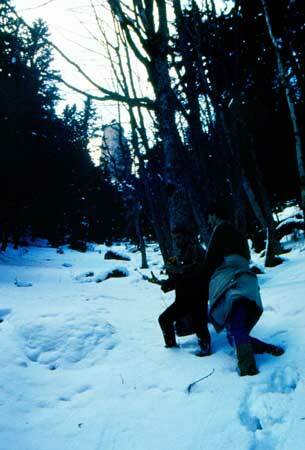 Highest concentration is found around the Aries Valley, Tara Motilor as it is also shown in the history of the place. 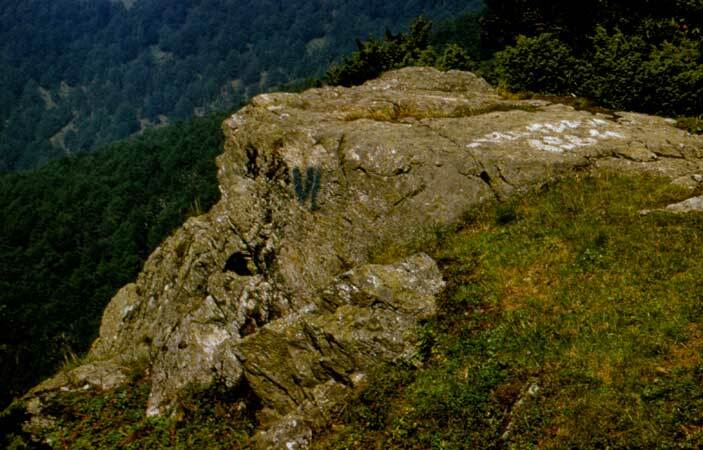 This is my attempt to draw on the map that finding, although bearing in mind that this could also be just a personal fantasy.